This digital photo enlargement software helps you to print photos (digital photos, film photos, digital art, graphics, scanned images, any digital image file) of huge size by enlarging it using highly advanced photo enlargement engine and splitting to the sheets of paper. You can apply 8 wonderful effects You can set any image size you want. Moreover you can save project and load it on other computer. Also you can export image with effects applied. 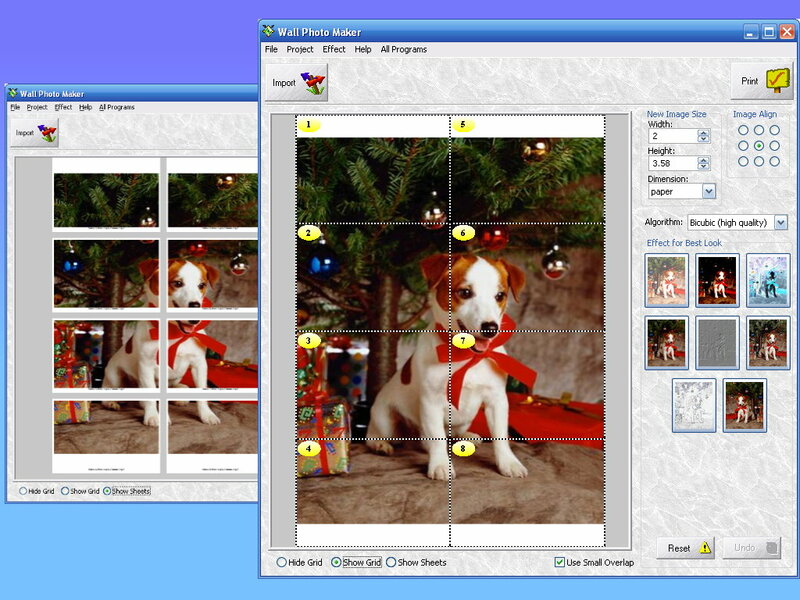 This gives you an opportunity to surprise people with amazing gifts or print your friend's photo of full wall size. For prints, film, and original artwork we include a professional scan of your photo. If you want your wallpaper to appear shiny. Photo Glossy Paper: Epson Glossy Photo paper, HP Glossy Photo paper, 81/2"x11", 50lb., 89 Brightness Bright white, ultra smooth coated glossy paper specially designed for ink jet printers. Best glossy paper for photo quality prints. Ideal for showcasing professional photos. Offers the look and feel of professional photos with unparalleled image quality and superior gloss finish. Smear proof and water resistant. Dries instantly. Extra heavyweight. Both types of paper are ideal for printing your own digital photos, reprints, enlargements, posters, displays & portfolio images with superior image quality. Note: We are using Bicubic high quality interpolation method for getting the best results.